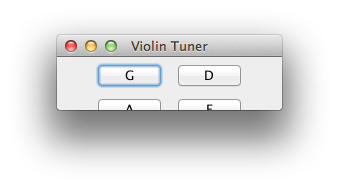 I'm trying to apply sound today, and the goal in mind was a simple violin tuner. The actionListener seems repetitive/ How might I optimize it (what I tried just broke everything)? I also noticed the sounds bleed into each other. I don't mind that so much for the different keys (though I'm thinking of a toggle option for this) but it also is the case for the same key, which is undesirable. I'm not sure how to handle that. Why play a WAV file, when you could synthesize the tones using MIDI? The tones can be played with indefinite length. You wouldn't need to distribute supplementary files with the program. You can also easily modify the program to generate other pitches without having to obtain new WAV recordings. // Orchestras tune to oboes. Instead, call frame.pack() to automatically set the frame size according to its contents. The code is awfully repetitive. You should avoid repeating yourself, since repetition makes maintenance difficult: cut-and-paste programming leads to cut-and-paste bugs. I recommend using an Enum to represent the four notes. It's bad practice to catch (Exception x). I have no clue what kind of exception would likely cause the flow of execution to jump to the exception handler. You, as the author, might intend for certain exceptions to be caught, but you don't know what will actually happen. Starting with Java 7, you can list multiple exceptions to be handled by the same catch block, and that's what I recommend that you do. It's OK to use wildcard imports with the standard Java packages that almost every Java programmer is familiar with (such as java.io. * or java.util.*). It's OK to use one wildcard import per file, maybe two, but not much more. If in doubt, import individual classes explicitly. By the way, you never used anything in java.awt.*. This cleans up the multiple if-else, because now there are 4 listeners instead of 1, and each is dedicated to one key. And there's no more need for checking the source of the event, as the listeners are dedicated to a single button. Another change I did there, instead of catching Exception, I spell out all the possible exceptions that might be thrown there. This is a recommended practice in general. Often you might want to handle each exception a little bit differently, but in this simple case it just helps me see what exactly can go wrong in that block of code. Finally, remember to close all streams that you opened, in this example the AudioInputStream. While holding a violin in the left hand and a bow in the right hand, it can be difficult to grab a mouse and click on the appropriate button. You can, however, tap a key on a keyboard relatively easily. Therefore, I suggest adding a KeyListener to handle G, D, A, and E keys. I also suggest mapping Space to A = 440 Hz, since it is the easiest key to hit and the standard pitch to tune to. If you're going to use audio clips instead of using MIDI, why not use a simple library like tinysound? That way, you don't have to care about creating clips, making sure the Wave-files are in a correct form, etc. It may not be the thing for you if you want to make a product to take on Cubase, but it's probably exactly the type of library you'd want now. Not the answer you're looking for? Browse other questions tagged java beginner event-handling audio or ask your own question.